During the time of Patriarch Michael I Cerularios (1043-1058) of Constantinople, a pious Christian, named Nicholas, made a vow never to forget his patron's feast day. This he kept unfailingly, according to the words of Scripture: "Honor the Lord by your righteous labors" (Prov. 3:9), and he always firmly remembered this. When this Nicholas reached an advanced age, he fell on hard times. And when the 6th of December approached, he had nothing in his poverty with which to celebrate the day. Pondering to himself what to do about it, the old man said to his wife: "The honorable day of the great hierarch of Christ, Nicholas, is coming; how can we poor ones celebrate this day in our poverty?" The pious wife answered her husband: "You know, my lord, that the end of our life is near, for old age has overtaken both you and me; even if we have now come to the end of our life, do not change your vows and do not forget about your love for the Saint." She showed her carpet to her husband and said: "Take the carpet, go and sell it and buy all things necessary for the worthy celebration to the memory of St. Nicholas. We have nothing else, and we don’t need this carpet, for we have no children to whom this could be left." 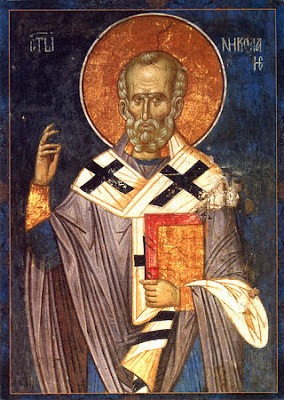 On the way to the market, by the Church of Saint Platon, the pious Nicholas encountered an honorable elder, who was Saint Nicholas himself. The Saint stopped Nicholas and asked concerning the carpet, saying, "For how much do you wish to sell your carpet? I would like to purchase it." Nicholas answered, "At one time the carpet was worth eight gold coins, but I will take whatever you offer. "The Saint asked, "Will you accept six gold coins for it?" The old man replied, "If you give me that much, believe me, I will take it happily." Thus the exchange was made though the old carpet was worth much less. Those present turned to the old man Nicholas and said, "With whom are you speaking old man? Why do you converse alone?" They spoke like this because they could neither see nor hear Saint Nicholas. In the meantime, the Saint took the carpet and went to Nicholas' wife, saying, "I met your husband, my good friend, and he asked me to return this carpet." The wife gazed upon the Saint seeing an honorable elder resplendent with light before her. She became speechless at the sight of him and was afraid to ask him his name. The Saint then departed. Left alone with her carpet, the wife became angry with her husband and said: "Woe is poor me, my husband is a transgressor and full of lies!" Disgusted, she could not bear to look upon the carpet. When her husband later returned, the indignant wife told him: "Henceforth go away from me, for you have lied to St. Nicholas. Truly said Christ, the Son of God: 'No man, having put his hand to the plow, and looking back, is fit for the kingdom of God' (Lk. 9:62). Having said these words and others similar to them, she brought the carpet to her husband and said: “Here, take it, but you shall never see me again; you have lied to St. Nicholas and, therefore you shall lose all that you shall achieve by the celebration of his memory. For it is written: 'If a man shall keep the whole law, and yet offend in one, he is guilty of all” (cf. Jam. 2:10). The old man was astonished at both her words and finding the carpet returned to his house. Meditating upon all these things, he finally understood that the glorious elder in the square was none other than St. Nicholas. When he found out from his wife that the same radiant elder visited her that day with the carpet, he then showed her the gold that remained from the sale of the carpet and the articles purchased by him for a proper celebration, that is, food, wine, prosphoron breads, and candles. Both Nicholas and his wife then sent up thanksgiving to the Saint, saying: "Glory to You, O Christ God, Who has wrought wonders through St. Nicholas!" They went to the church and made known what they experienced to all the clergy. When Patriarch Michael was informed of the miracle, he ordered that the elderly and poor Nicholas and his wife receive an allowance from the property of the Church of Hagia Sophia.